Let’s get right to opening up the Big Blue View mailbag to see what New York Giants-related questions we have this week. 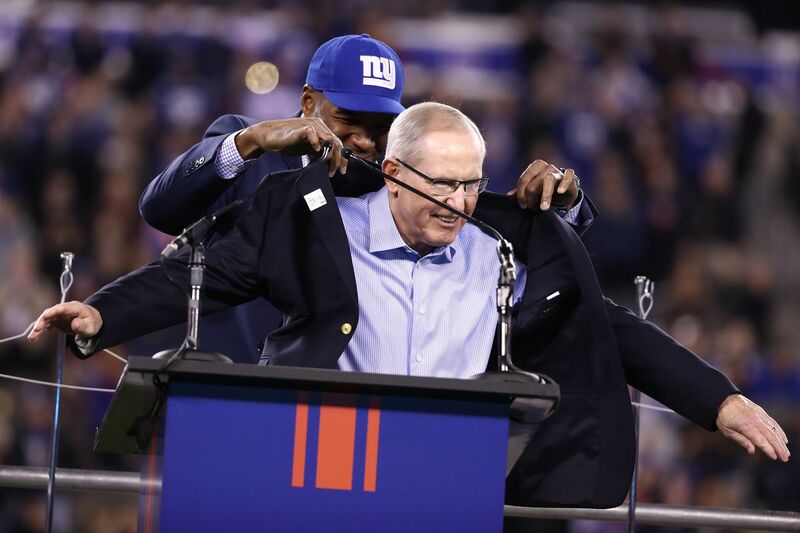 Do you think there is any chance the Giants would consider going back to Tom Coughlin if McAdoo gets fired? I know it's unlikely but it sort of reminds me of the situation in Carolina where they brought back the former GM to bridge the gap until they find their next GM. Could you see Tom coming back, perhaps with more control over personnel, for the last few seasons with Eli with the understanding they would then start a new era with a new coach, GM and QB after? Ed says: I spoke about this a bit on Big Blue View Radio, but let me also answer it here. I don’t think there is any chance the Giants would ask, or that Coughlin would accept. First off, Coughlin has a job and his team — the Jacksonville Jaguars — are on a good path. Secondly, the Giants aren’t going to go crawling back to Coughlin, tell him they screwed up and beg him to come back and try to save them. The last point is, why on earth would Coughlin want to do that? The Giants embarrassed him when they scapegoated him for their struggles. Ownership pushed the borderline Hall of Fame coach out the door and chose GM Jerry Reese while they also admitted that the rosters put together by Reese hadn’t been good enough. If I’m Coughlin I’m enjoying watching the Giants implode. Why won’t our GM/HC go after ANY offensive linemen or RB either in free agency or in the draft? Ed says: That’s not entirely accurate, or fair. Ereck Flowers and Justin Pugh were first-round picks by the Giants. Weston Richburg was a second-round pick. They did sign D.J. Fluker and use a sixth-round pick on Adam Bisnowaty this past offseason. What they didn’t do in the offseason is acquire any big fish in the draft or free agency who would have been real difference makers. The real question is why won’t they admit that Flowers is not a quality left tackle and move on from that mistake? No one likes to admit they were wrong, but GM Jerry Reese is especially stubborn about moving on from draft picks when they don’t work out, and that is to the detriment of the franchise as a whole. The Giants did draft Wayne Gallman in the fourth round. Shane Vereen is a guy they signed as a free agent. What you’re really asking is why didn’t the Giants go after any of the big-name guys? I will continue to say that if you can block you can run, so that really shouldn’t be a big deal. I have tickets to the game on Sunday. Should I bother going? Ed says: That’s entirely up to you, but you already spent the money. I’d go if I was you (and I will be at the game in the press box). You might enjoy the game, or at least the tailgate if that’s your thing. If the game stinks you’ll get to boo, and that’s a message John Mara will hear. Since the season is lost. Who are you cheering on for the rest of the season? Ed says: It’s funny, when I was a kid I was a Giants fan. When you do this for a living and write about a team every day, multiple times a day, you put that away. You have to. I do root for people, and despite all of the garbage going on with the Giants this season there are a lot of really good people in that locker room. I root for good things to happen to good people. Who are some of those guys? It’s hardly a complete list but Eli Manning, Jonathan Casillas, Damon Harrison, Donte Deayon, Matt LaCosse, D.J. Fluker, Nat Berhe and Justin Pugh are among them. Ed says: I’m not a fan of the derisive nicknames for GM Jerry Reese and head coach Ben McAdoo, but the question of what can be expected from the Giants over the final nine games in terms of wins and losses is a valid one. As of right now, there isn’t a single game on the remaining schedule (vs. Rams, @ 49ers, vs. Chiefs, @ Redskins, @ Raiders, vs. Cowboys, vs. Eagles, @ Cardinals, vs. Redskins) in which the Giants should be favored. I do think the Giants can, and will win, some of those games. This Sunday’s game against Los Angeles is winnable. I don’t, however, think we will see any sort of dramatic turnaround. Too much has already gone wrong. My guess is that, at most, this turns out to be a four-win season. Where that puts the Giants in the 2018 NFL Draft order is anyone’s guess. Who do we resign Fluker, Richburg, or Pugh could be a huge target in Free Agency? Ed says: I’m on record as saying that re-signing Justin Pugh has got to be a priority for the Giants this offseason. He’s a good player, he’s a leader and his versatility — and willingness to move around — make him really valuable. Whether or not the Giants have the salary cap space to sign both Pugh and Weston Richburg, I really don’t know. If they have to choose only one rich contract for an offensive lineman, it has to be Pugh. As for Fluker, I would like to see him back, as well. His toughness and his upbeat attitude are both things that can help the Giants. Ed says: It’s just way too early to know that. There is half a season yet to play, and no way to know who will be kept or cut. And assuming what the Giants will do in the draft is silly this early. Here, though, is a list of possibilities. Ed says: I can see where that idea might come from, but no. At the beginning, players didn’t like Coughlin. He didn’t know how to relate to them, or didn’t try to, and din’t run the country club the Giants became at the end of the Jim Fassel era. But, they respected his rules, knew what he was trying to accomplish, and didn’t challenge his authority. McAdoo is seeing his authority challenged and that is a whole different issue. When there is no discipline and players appear not to respect the authority of the coach that is difficult to come back from. Does lack of action at trade deadline portend large changes in the offseason? Ed says: I honestly don’t think one has anything to do with the other. There are nine games left and those have to play out before any sort of offseason plan can be formulated. Right now, lots of speculation here and elsewhere about the future of Ben McAdoo and Jerry Reese. Maybe they will both be gone. Maybe, though, ownership isn’t as unhappy with them as fans and the media are. We don’t know. Let’s see what happens the rest of the season and, ultimately, who ends up making those offseason decisions. If the @giants end up with a top 5 pick in the draft... do you really think they would go after a QB even after drafting Webb last year? Ed says: Quarterback absolutely has to be in play if the Giants are picking that high. His presence will have nothing to do with whether or not the Giants would pick a QB in that spot. If you are sitting there and you have a shot as franchise guy you can’t pass just because you took a flier with a third-round pick the year before. That will be especially true if the GM is someone other than Jerry Reese.